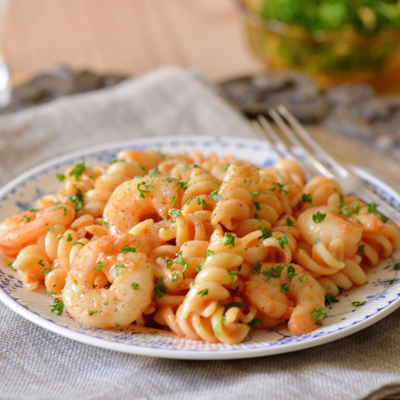 Today we will cook a rich first course or even single dish: Pasta with shrimp. Do you know which are the benefits of pasta? The pasta is a great source of carbohydrates, important component for a healthy diet. Thanks to that level high carbohydrates and low in fat, the paste doesn´t get fat us. It allows a good digestion. Pasta is digested slowly and it help our body to get all the necessary nutritional benefits. Moreover, pasta help our inteletual performance, because the brain is nourished by glucose and it is founding in carbohydrates. Pasta, allows a good physical performance, for this rason, the athletes eat before and after doing any sport with high energy efficiency. Finally, we conclude that according to a study published in the journalof Internal Medicine of the American Medical Association, if you eat a diet with high levels of carbohydrates and low in fat you will be able to have lower levels of anxiety and depression, so you will be happiest. Would you like to try if this study is telling the truth? Let’s start with our recipe for Pasta with shrimp. 2 dried chilies from tree. First you have to put the dried chiles in hot water to soak for 30 minutes. Then, you enter those dried chiles without seeds, with a little milk, tomato sauce, the clove of garlic peeled and a spoonful of chicken broth a blender. You must blender until you see that a uniform and smooth sauce is. Next, you heat up a little oil in a frying pan and check shrimp, until you see that they are made, and they have caught a pink tone. On the other hand, you must cook the pasta in a pan, approximately 10 minutes since the water is boiling, and then you strain it once and keep it. Then, you add the sauce that we have left in the blender to shrimp fried. Next, you move it all so it does not stick and let the mixture thickens. When the mixture is thickens, you must add the pasta and mix it all again. When you served on the plate the pasta, you can add a pinch of pepper and a little parsley. Voila! Our pasta dish is ready, with a totally different sauce. Mediterranean Diet, Mediterranean Recipes healthy, healthy diet, healthy habits, healthy recipes, mediterranean diet, mediterranean recipes. permalink.